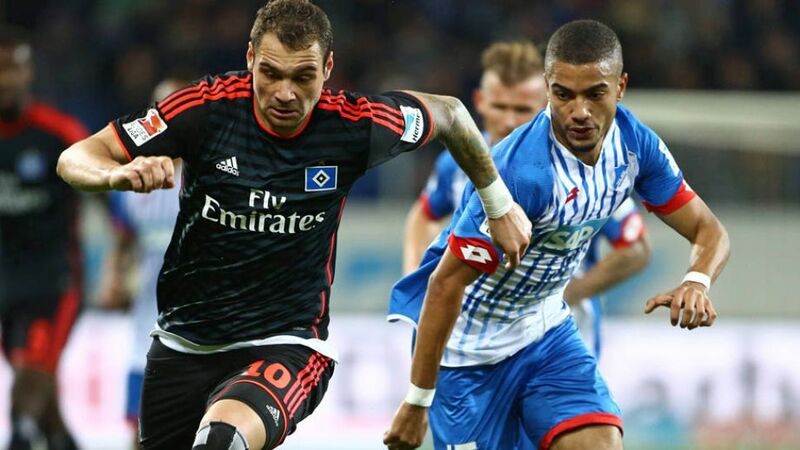 Sinsheim - Pierre-Michel Lasogga scored two minutes from time to give Hamburger SV a 1-0 win over ten-man TSG 1899 Hoffenheim in Friday night's Matchday 10 opener. Making his first start of the season, Adam Szalai gave hosts Hoffenheim more of a physical presence in the final third in the early stages. The Hungarian striker forced Hamburg goalkeeper Rene Adler into action with a tenth-minute header, but the home side subsequently found chances to be at a premium. HSV, by contrast, were playing with great purpose as Michael Gregoritsch sent a bullet header narrowly over, before Hoffenheim custodian Oliver Baumann thwarted Nicolai Müller and Lasogga with a sublime double save. Gregoritsch went close with another header early in the second half, with HSV continuing to ask all the questions of their languid hosts. Ermin Bicakcic’s 67th-minute sending off for two bookable offences presented the visitors with a golden opportunity to go on and take all three points, but the visiting fans were made to sweat as Hoffenheim’s Jeremy Toljan threatened an unlikely winner. Adler saved well at the roaming German winger’s feet, and that stop proved decisive when, barley a minute later, Lasogga turned home former Hoffenheim striker Sven Schipplock’s low cross for the win. Hoffenheim might be beginning to rue the day they got rid of Gregoritsch. The Austria Under-21 international, who spent four years in Sinsheim, was everywhere for HSV and put in exactly the sort of energetic individual display the home side are so dearly lacking at present. Irrespective of the result, this was another flat team performance from Hoffenheim. One win from nine matches is not the required level for a team that was pushing for a place in Europe last term. HSV’s Gregoritsch had the most shots on goal in the first half along with Lasogga (three).Lasogga has scored four Bundesliga goals this season.Hoffenheim are without a home win all season.